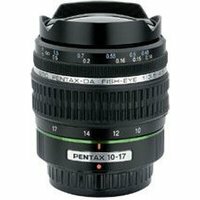 Mounted on the Pentax series of digital SLRs, the DA Fish-Eye 10-17mm lens will capture fish-eye imagery with a 180 degree angle of view and a focal length of 10mm as well as super wide-angle performance. Capture images with an expanded perspective including creative deformation of subjects and sharp pan focus that extends throughout the entire frame. The image circle in DA-series lenses is designed to perfectly match the 23.5mm x 15.7mm size of the CCD used in Pentax digital SLRs to optimise camera performance.